Chor der Wiener Staatsoper, Orchester der Wiener Staatsoper / Michael Boder. Wiener Staatsoper, Vienna, Austria. Saturday, April 13th, 2019. Once the killing starts, where will it end? Manfred Trojahn’s Orest picks up where Strauss’ Elektra left off. 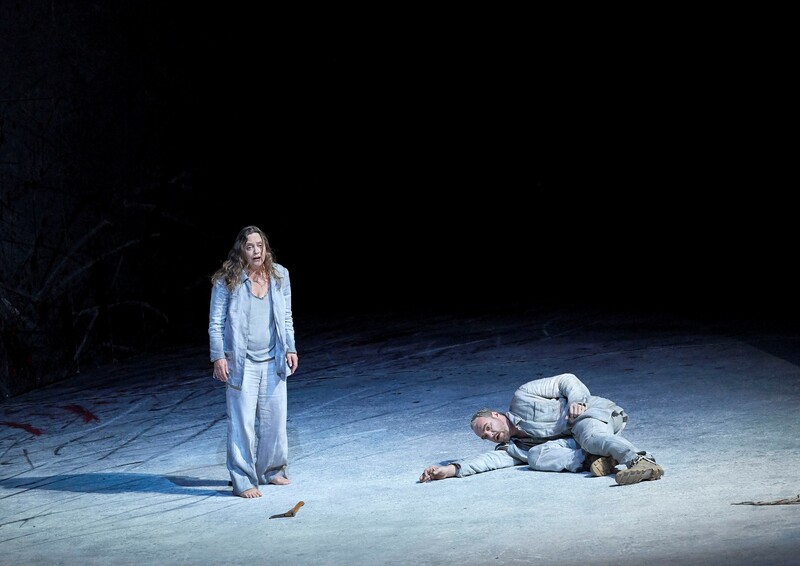 Premiered in Amsterdam in 2011, the work was selected for a new production here, at the Wiener Staatsoper, to be directed by Marco Arturo Marelli. It was quite felicitous casting to engage Evelyn Herlitzius, surely the greatest exponent of Strauss’ Elektra today, in the role of Orest’s sister. There are indeed echoes of Strauss in the world setting and it felt quite comforting, in a way, to hear that familiar voice intone ‘allein’ or ‘Orest’ using similar musical patterns. Trojahn gives us a ‘Musiktheater’ in six scenes to his own libretto. It portrays Orest as a tortured figure, haunted by his own actions, while Elektra is hell-bent on continuing her murderous obsession, this time aimed at Helena and Hermione. It’s a high-octane ride, building in inexorable tension throughout its eighty-minute running time. Trojahn creates a fascinating sound world. An off-stage vocal consort is amplified from speakers scattered around the auditorium, with cries of ‘Orest’ at leaping intervals, the sibilants echoing around in space. Trojahn also gives us intricate string writing, from barely perceptible harmonics to deep, extended visions of the pits of despair. Throbbing percussion pulsates the action forward, jabbing with the sharpness of that all-threatening axe. 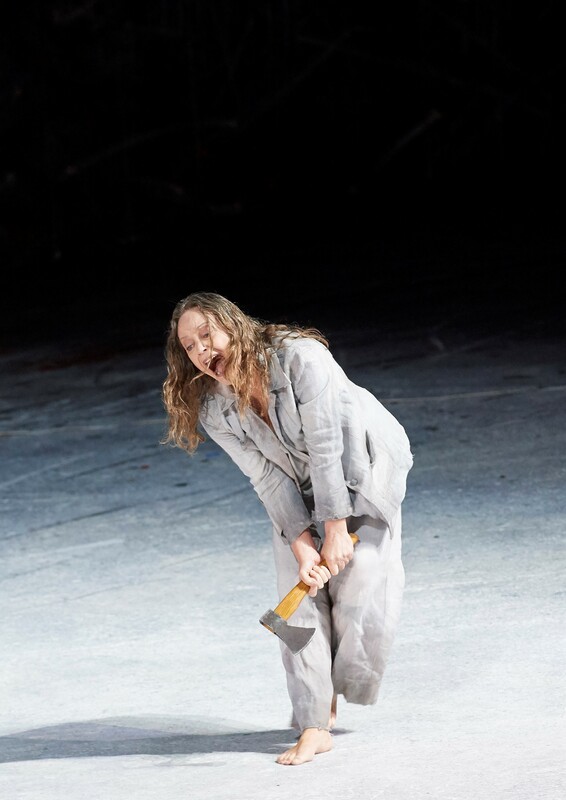 Each character has his or her musical language – for Elektra it’s violent edginess, for Helena, melismatic dreaminess. The orchestration has moments of extreme delicacy, as in a haunting lullaby for Elektra, but it’s also extremely thick in places, meaning that Thomas Johannes Mayer’s Orest was pushed to the extremes. The vocal writing is fiendishly difficult – full of leaps across the registers – but the entire cast had clearly been exceptionally well prepared, making it sound like the easiest thing in the world. Marelli’s staging was serviceable. It told the story logically, with narrative clarity that allowed the singers to create believable, three-dimensional characters. The imposing set (also by Marelli) was constructed from a semi-circular tunnel, starting from an unknowable place and leading to a destination that remains uncertain. Signs of singeing at the back of the set suggested a trauma and violence that fed into the present. Having also designed the lighting, Marelli made some interesting use of shadow – again reinforcing the influence of characters on events. Vocally, it was an extremely strong evening. Mayer was unstinting in the title role. It requires considerable heft and the ability to sustain some high declamatory writing. Mayer was never afraid to sacrifice beauty of tone to portray the desperation of his character, to the extent that it did find me somewhat concerned for the health of his instrument. His baritone is quite dry and leathery now, but his acting was always affecting and the sheer energy that he brought inspired admiration, even if it wasn’t always easy on the ear. 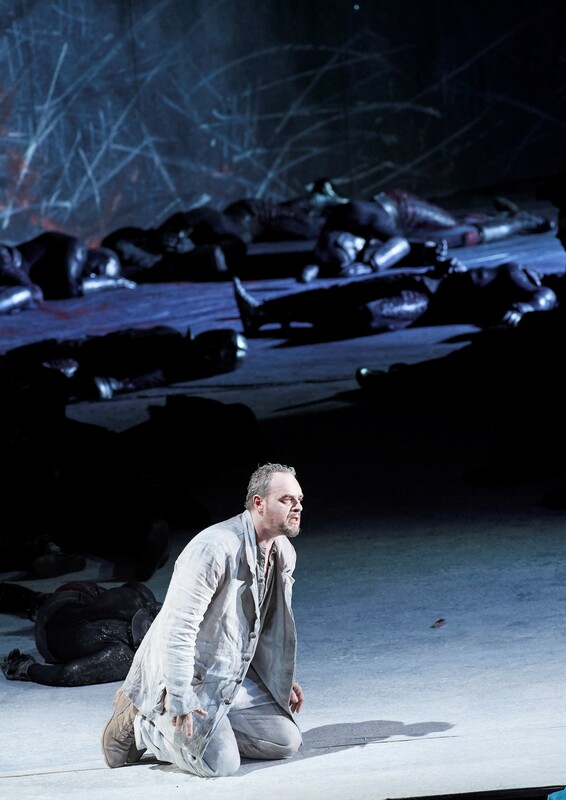 Daniel Johansson brought his beefy tenor to his roles. He negotiated the angular vocal writing with ease. Again, there was a slight sense that he was giving a little too much vocally, but it was an impressive assumption of a relatively thankless role. Thomas Eberstein’s Menelaos was sung in a healthy, characterful tenor with good sheen, the tone always bright and forward. Audrey Luna sustained the extreme tessitura with staggering ease and beauty of tone. The role of Hermione sits, and is sustained, in the stratosphere and she made it sound like a walk in the park. As her mother, Laura Aikin blended ravishingly with Luna in their soaring duets. Aikin fuller in tone but equally free and easy on top. Aikin also has undeniable stage presence, working it across the stage in heels and a striking gold lamé dress that revealed an impressively long train as she was raised on a chair up into the flies. Then there was Herlitzius. The autumnal warmth of her soprano, familiar from so many memorable manifestations of Strauss’ heroine, lent her assumption of Trojahn’s daughter of Agamemnon a familiarity that felt absolutely right. More than that, she sounded like she had been singing this particular role all her life, singing and acting with a commanding sense of authority. As always with this great singing-actor, so much was communicated through the text, every word registering fully. The voice rose from a full and rounded bottom, to that steely, penetrating top. A truly remarkable assumption. Tonight, the Wiener Staatsoper gave this important new opera a performance of exceptional quality, with the house orchestra offering playing of staggering virtuosity under Michael Boder’s naturally paced direction with the faceless voices of the off-stage vocal ensemble pitching their difficult lines with astounding accuracy. The principals made Trojahn’s exceptionally difficult vocal writing sound deceptively easy. Orest is a challenging piece, especially for the performers, pushing them to the boundaries of the possible. At the same time, it’s a work that most certainly deserves further exposure and discussion. It distils the drama into a finely crafted and highly intense experience. 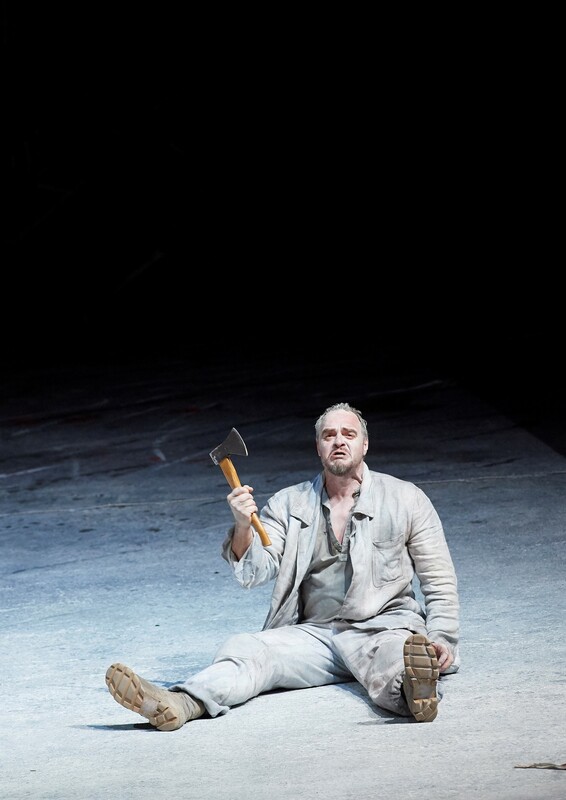 The rapt concentration and focus given to this performance by the Staatsoper audience, as well as the warm ovation at the end, both to the cast and to Trojahn himself, is a sign that this is certainly a work with a future. Perhaps a brave intendant somewhere might like to offer Elektra and Orest on successive evenings. That, would be a most tempting offer.